I hope this can help give some ideas for the upcoming holidays. Have a fun, safe, and relaxing Thanksgiving!! And please know how thankful for you. Now go eat and enjoy!!! Preheat oven to 350. Start with your sweet potatoes. Of course I bought pre-pealed pre-cut sweet potatoes from Trader Joe’s. You can get them in the freezer section at Whole Foods too. Or you can just use 4 large sweet potatoes, peel and chop them. Then, boil the sweet potato in a large pot of water for about 10 or so minutes until they are fork tender. Next put in a food processor with the rest of the “Filling” ingredients and blend until smooth. 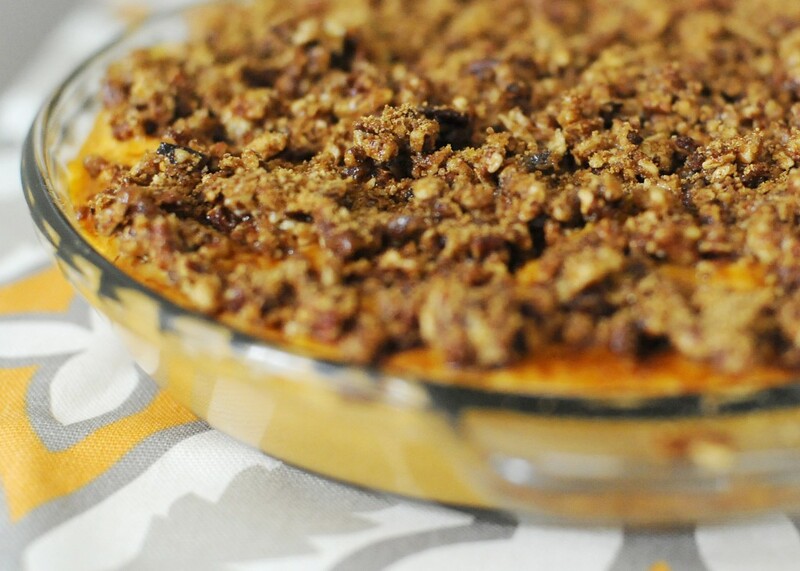 Move the pureed sweet potato filling to a 9″ Pyrex glass pie or glass baking dish. For the topping, mix in a medium bowl all of the ingredients except for the coconut palm sugar. Then spread the “Topping” over the “Filling”. Dust 1 tbsp of coconut palm sugar evenly over your topping. Cook on 350 for 20-25 minutes and enjoy!